I wanted to try out a computer vision project, and what better way to do that than to point out where dogs are in photos?? I’ve included a Github repo and Jupyter notebook for this project. This project uses the ImageAI computer vision library for Python, which offers support for RetinaNet, YOLOv3, and TinyYOLOv3 algorithms for object detection. The model used is a RetinaNet model pretrained on the ImageNet-1000 dataset, also provided by ImageAI. Official guide and documentation for ImageAI detection classes are provided as well. person, bicycle, car, motorcycle, airplane, bus, train, truck, boat, traffic light, fire hydrant, stop_sign, parking meter, bench, bird, cat, dog, horse, sheep, cow, elephant, bear, zebra, giraffe, backpack, umbrella, handbag, tie, suitcase, frisbee, skis, snowboard, sports ball, kite, baseball bat, baseball glove, skateboard, surfboard, tennis racket, bottle, wine glass, cup, fork, knife, spoon, bowl, banana, apple, sandwich, orange, broccoli, carrot, hot dog, pizza, donot, cake, chair, couch, potted plant, bed, dining table, toilet, tv, laptop, mouse, remote, keyboard, cell phone, microwave, oven, toaster, sink, refrigerator, book, clock, vase, scissors, teddy bear, hair dryer, toothbrush. This made it very easy to detect dogs specifically! All I had to do is set up my project, download the pretrained model, and set a few parameters and filepaths. The entire project only took about 20 minutes from setup to output image. Any of the object categories can be included here. We are not just limited to dogs, and we can include as many categories as we want -- or potentially all of them -- in the same detector. minimum_percentage_probability refers to how confident the model should be before drawing a bounding box. We can set it to a low percentage, e.g. 15%, if we want it to flag everything it sees. We can set it to a high percentage, e.g. 85%, if we only want it to flag objects when the model is confident about what it’s detecting. Overall, fairly decent results, especially considering the short amount of time it took to set up. 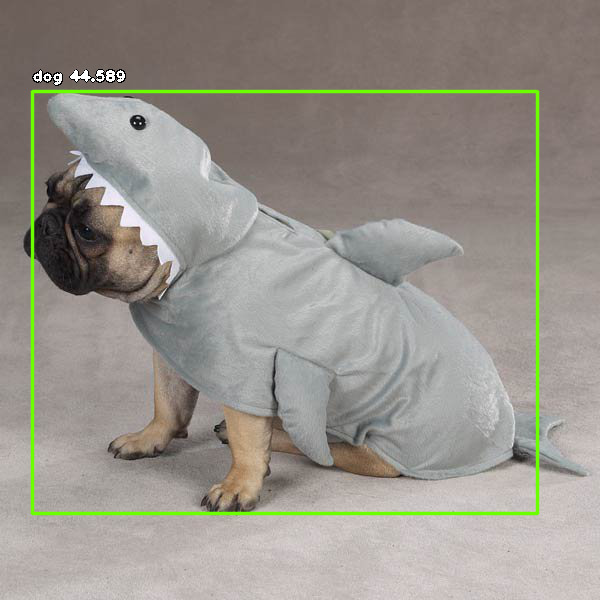 The boxes are bounding boxes for the dog (or animal, or bird) detected, with the object name and prediction probability.